Today I have a fun, quick Card to share with you that I made with the December Wish Big Creative Cafe' Kit. 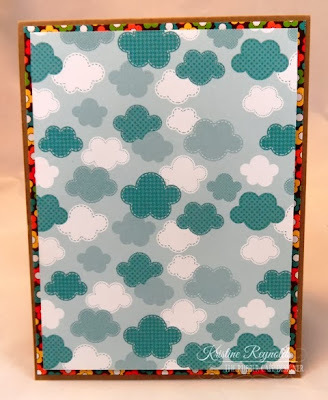 Adhere the cloud paper to the flowered paper with Scrap Happy Sheer Glue. 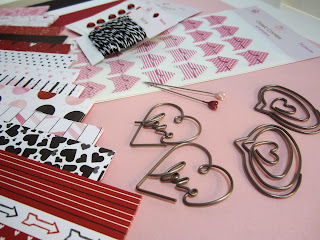 Layer the re the patterned paper to the brown card base. 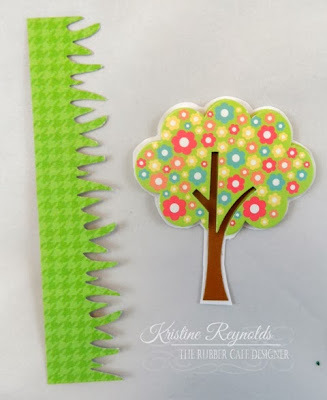 Adhere the tree sticker that comes with the kit to a white scrap and trim around the tree leaving a little white frame. 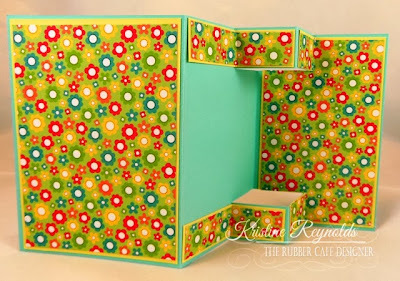 Punch the green panel with a "grass" punch or use scissors to cut grass. Tie ribbon from the kit around the top of the card. 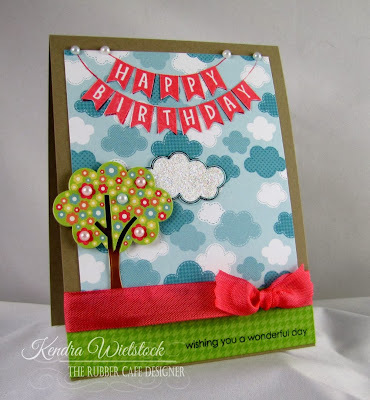 Adhere the "grass" and the tree to the card with Scrap Happy Sheer Glue. 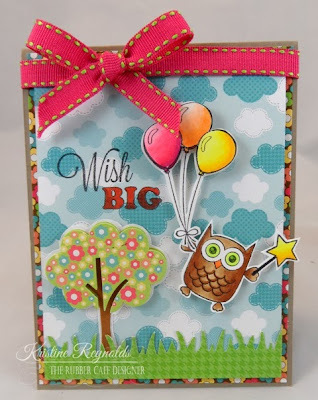 Stamp the sentiment on the card and color in the "Big" with a pink marker. 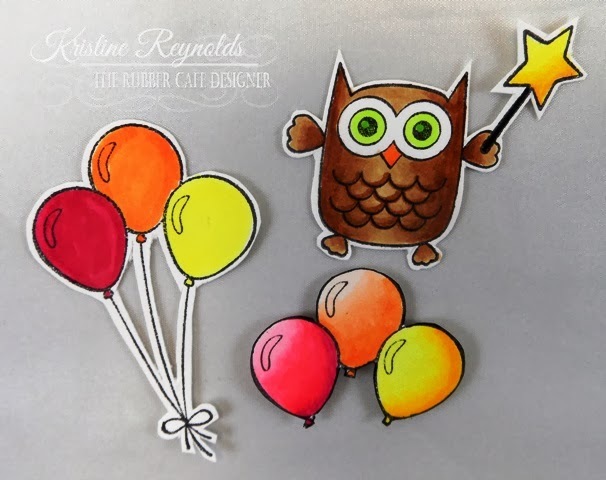 Stamp the owl and the wand on a scrap of white cardstock, color with copic markers and fussy cut out. Stamp the balloons two times on white cardstock and fussy cut out as shown in the picture below. 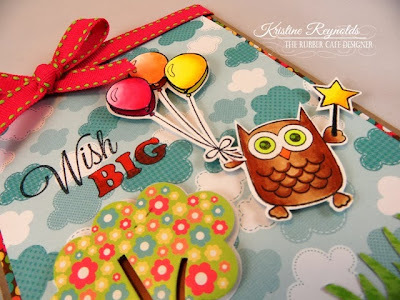 To finish, adhere the owl and balloons to the card as shown with 3d Foam Squares. Here's a view that shows the popped up images better. I hope you have been playing along with your kit all month long! Wait till you see next months kit and all the awesome design team projects! You'll be inspired! ribbon around this piece, then adhere to card. to jump start your crafting in the New Year!! creative ideas in the New Year!! Hi There! Welcome to the TRC blog! 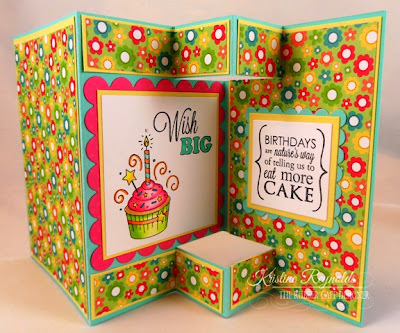 Today I have a fun Tri-Fold Card to share with you that I made with the December Wish Big Creative Cafe' Kit and the add on stamp set, Birthday Wishes. This card was a lot of work but it is amazing when it's done and the recipient will LOVE it! 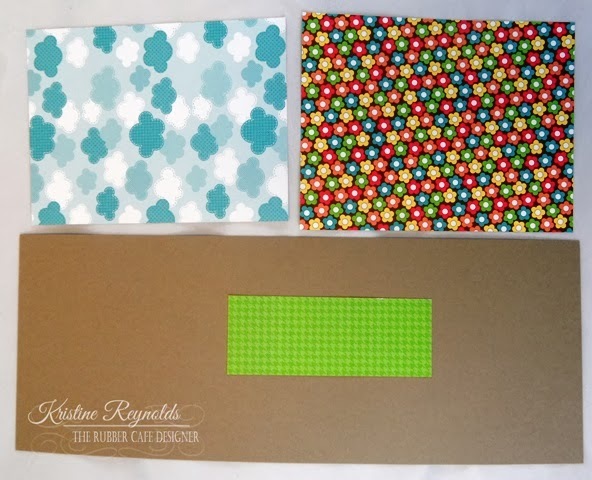 Start with a 11" x 5 1/2" piece of cardstock and score at 4" and 7 1/2". Measure an inch away from each edge and and inch and a half from each side of the 7 1/2" score. Score and cut on the line as shown in the picture below. 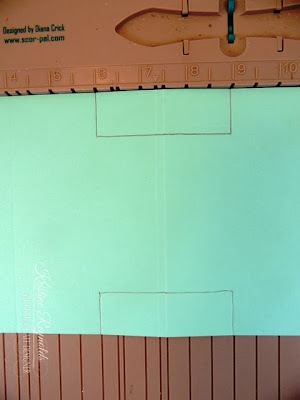 Measure each of the panels and then create paper panels 1/4" smaller to cover the panels as shown. Here is a closer look at the front of the card. I stamped the banners with pink ink on yellow paper and then fussy cut them out and adhered to the card with 3D Foam Squares. 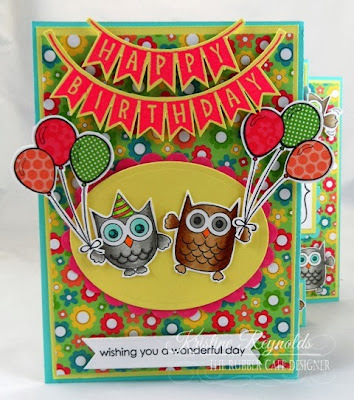 I stamped the owls on scraps of white cardstock and colored with copic markers before fussy cutting them out. I stamped the balloons two times on white cardstock and then two times on three different patterned papers which I used to paper piece the balloons. For the finishing touch stamp extra owls and cupcakes on white cardstock, color and fussy cut out. 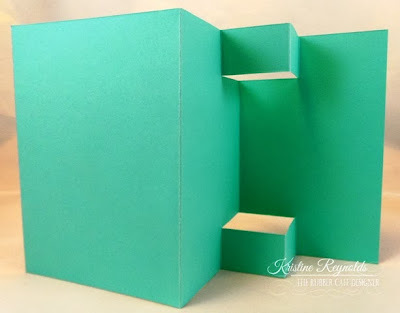 Adhere them to the card with 3D Foam Squares. This month's kit of the month is so fun! 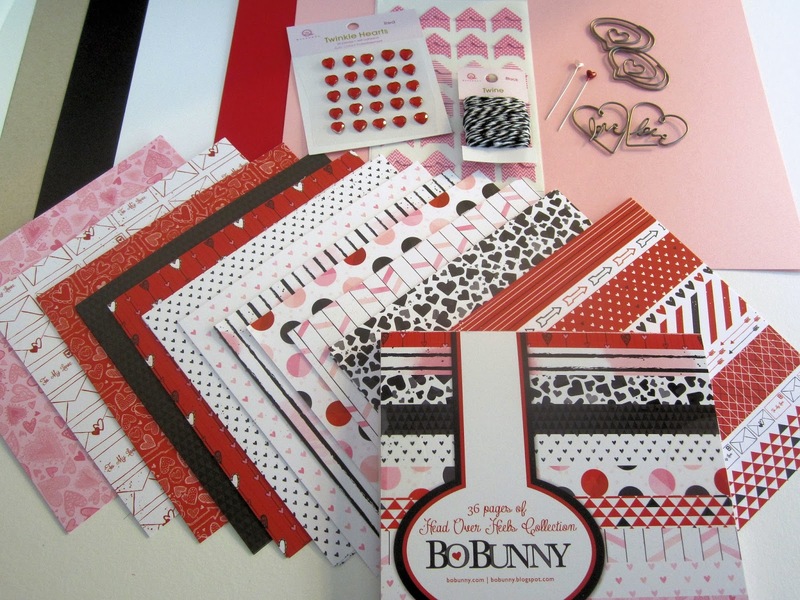 You will love all the bright colors and adorable stamps and sentiments. I hope this card has inspired you to get stamping! Hi Everyone!! 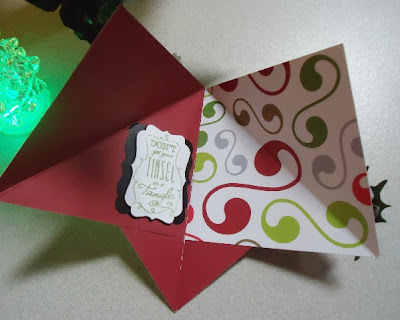 Today - I decided to go back to our previous kit from November and share a fun card I used to make my own Christmas cards with this year, called the Pyramid fold! Just arriving yesterday in Minnesota - I'm surrounded by Christmas and the flurry of final preparations for the upcoming holiday! 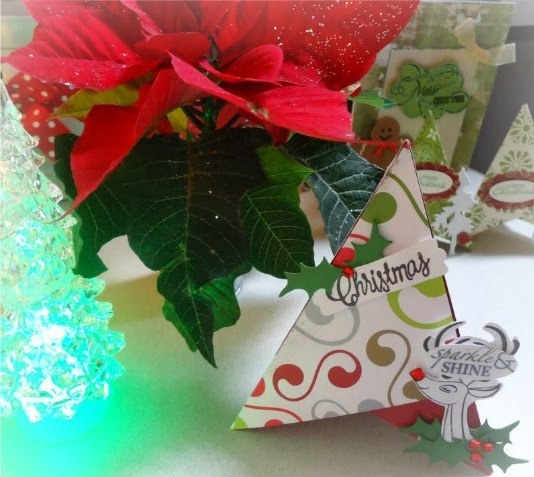 As I said, I'm featuring the stamps from our November Creative Cafe' kit stamp set - but if you were unable to get this kit, The Rubber Cafe'-has many other Christmas stamps available for your use. 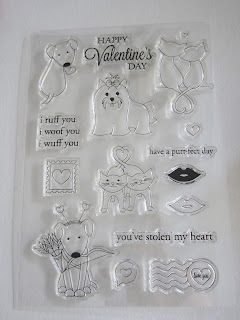 I made this card with (3) 4" square pieces- but the fun part is you can use any size you want as long as they are all the same. My mass production set was made with 3" square pieces. 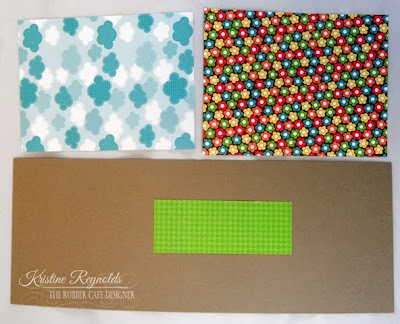 One 12 x 12 pc of cardstock or Patterned paper will give you 4 cards. 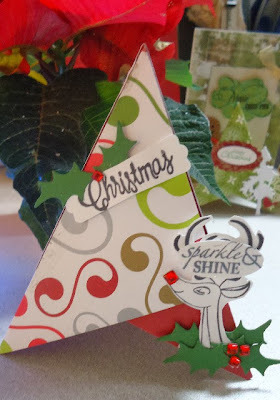 I am using this sweet reindeer to holds my tree closed while standing, you can use a decorative brad or any embellishment as long as you position it so the angled edge can tuck under. It's difficult to tell but I have used Diamond Clear Glitter on my Sparkle & Shine tag placed on his antlers. I diecut some holly leaves and used the red gems also from the kit for red berries. The Pyramid fold card itself really easy to make when you know how! Any other pieces are really just how you decide to embellish your Pyramid tree. 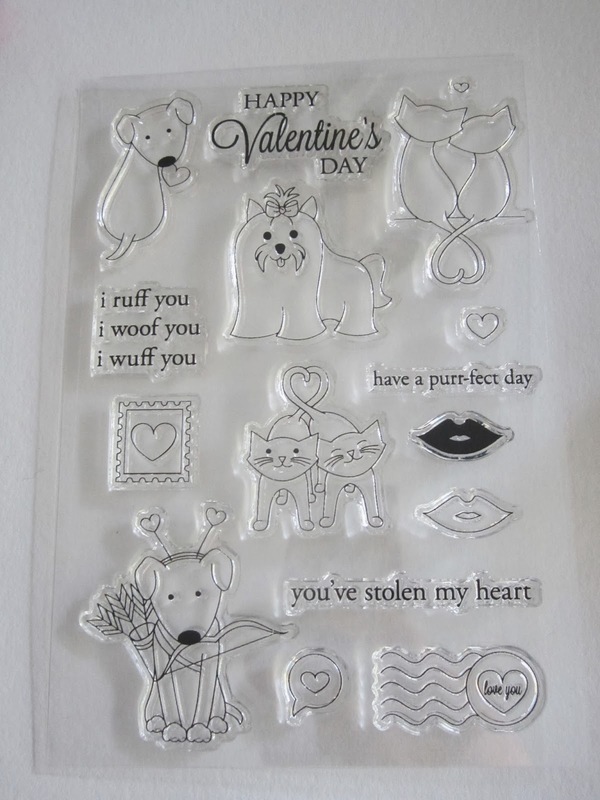 When choosing your paper- I really liked the double-sided prints, but just plan how you want to place your sentiment- you can always stamp and layer on solid cardstock if your paper is too busy. 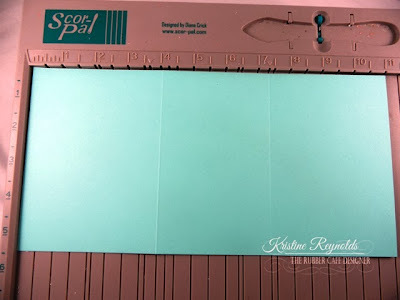 To assemble take your ScorePal and score a line from one point to the other - so you'll have a diagonal fold through each piece. Take and position one square at a 45degree angle so that your score line is positioned vertically. In my photo below you can see how the squares are joined -with my sentiment added. This is a double-sided paper with the solid cranberry on the opposite side of my print. 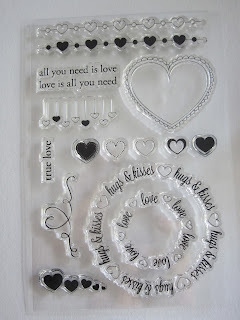 Here's another closer look at my sentiment - this and the chalkboard sticker behind it are also from November's kit. Once again my finished card! I hope you'll give these a try - they can be used for any occassion - I just loved the Tree shape they provided for Christmas, plus the fact you can open and fold them flat for mailing in any A2 size envelope make them all the more appealing! Creative Cafe Kit ~ Birthday Banner! Hello ~ Hello!!! 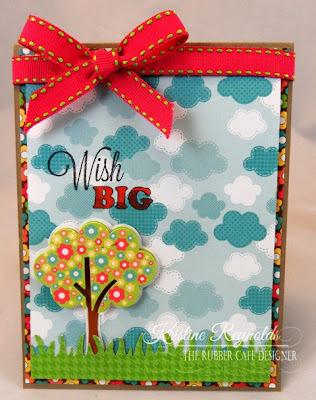 Kendra here today with one of my favorite cards for this month's Creative Cafe Kit called Wish Big. 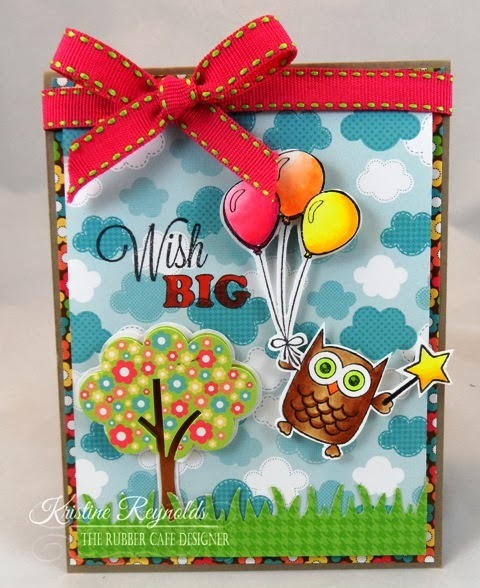 I just love all the pretty elements of this kit ~ the pop-up tree sticker, the gorgeous papers & ribbons and of course, the fun Birthday banner from the Wish Big stamp set. Happy Wednesday! Dawn Rene here to share two music note stamped necklaces I made for my daughter's friends for Christmas. 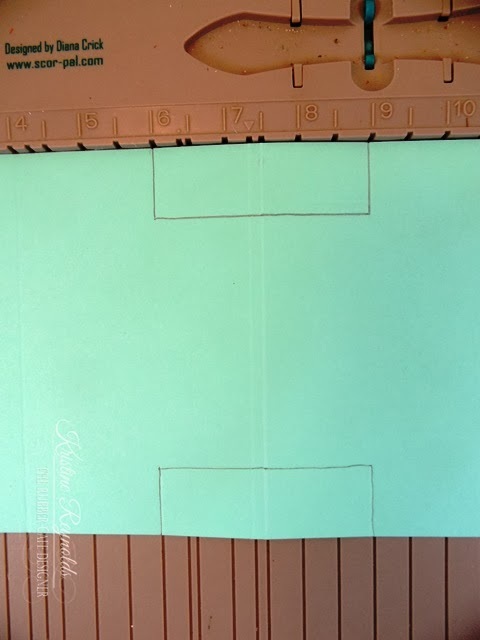 I stamped a music sheet from the Don't Be Washi set on white card stock with light brown ink. Then I stamped a note from the Music Notes set with Memento Tuxedo Black ink on top of it. I covered the stamps with a fixative spray. You can use any type of fixative, but this step is important so that the ink doesn't bleed when you add the diamond glaze. Even archival ink will bleed. I cut out a one inch square and glued it in a bezel I bought from Joanne's. I don't recommend this specific bezel because the hole at the top is very small so it really limits the chains you can use with it (unless you add jump rings which I didn't want to do). Normally I solder my own bezels but I wanted to show one that didn't require soldering. I filled the bezel with diamond glaze. You can also use resin or liquid glass. Before the glaze dried I sprinkled some You're So Fine Silver Glitter over the pendant to add some bling. Teenage girls love bling. On one of the necklaces I attached a fresh water pearl. On the other necklace I attached a fresh water pearl, a tiger eye gemstone, and a black onyx gemstone. I created tags to use as "packaging" for the necklaces. The necklaces are hung over the top and down the front of the tags. The edges around the front of the tags are dusted with You're So Fine Silver Glitter. I made pockets in the back where I stuffed the rest of the chain. 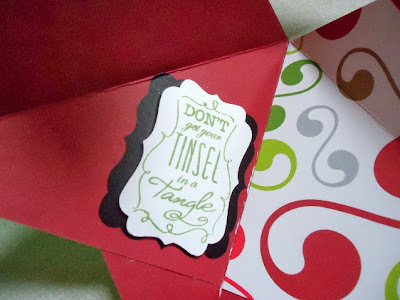 The "Happy Holidays" sentiment is from the Christmas Tidings stamp set. I cut the words apart so I could stack them. Then I finished off the back of the tags with faux stitching. 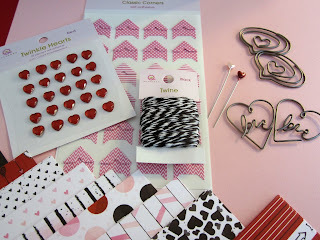 I stamped the Music Notes on white grosgrain ribbon which I tied on top of the tags. Here is another picture of the necklaces on the tags. I hope the girls like them! Hello The Rubber Cafe' Fans! Hope you are having a great week so far! 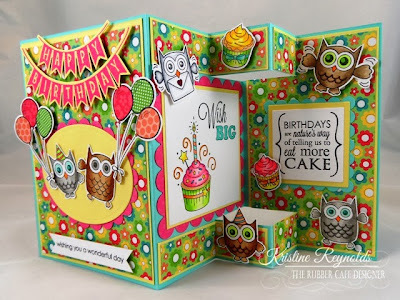 Today I took a break from my frenzied Christmas Card making and made a super cute birthday card using the December Creative Cafe' Kit of the Month - Wish Big with the Birthday Wishes add-on set. This was such a fun card to make. I did some paper piecing and just alittle bit of coloring on the owls. Here is a close-up of my card! 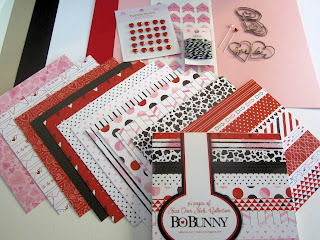 I really love the colors that are in the paper pad included in this month's kit! So cute! I paper pieced the balloons and the little envelope that the owl is holding in his beak. One of the ways I utilize as much paper from the kit as possible is that I don't throw any of my scraps away. I know it gets kinda hard to keep track of them but I have a cello bag that I put them in and I staple it to the back of my paper pad to hold the scraps. 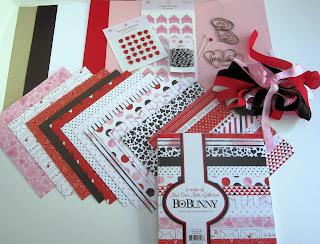 Then when I go to paper piece, I am sure to find just the right paper to use. 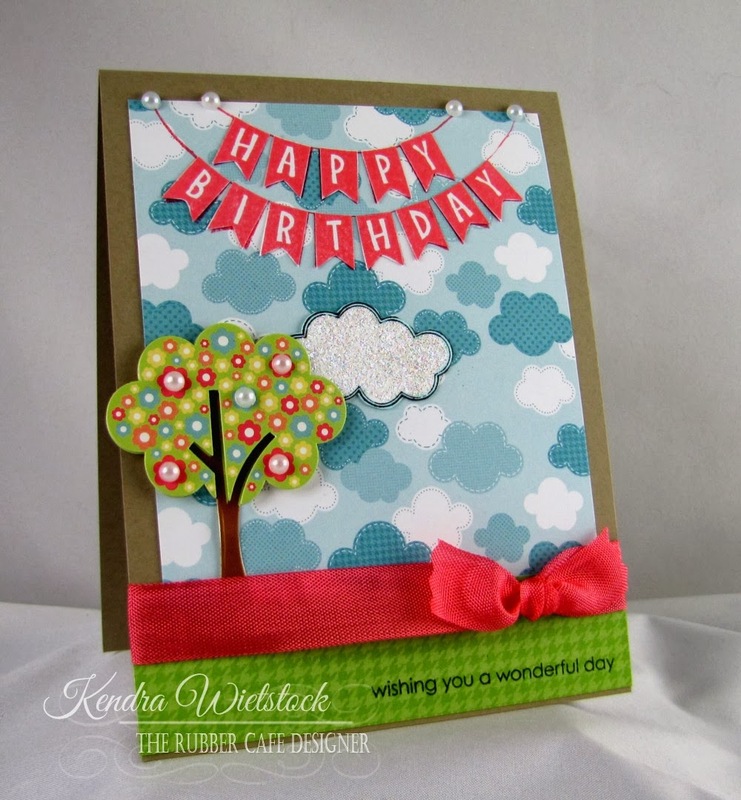 This card was super easy to make but it looks like you really worked a long time to make it! My favorite type of card! 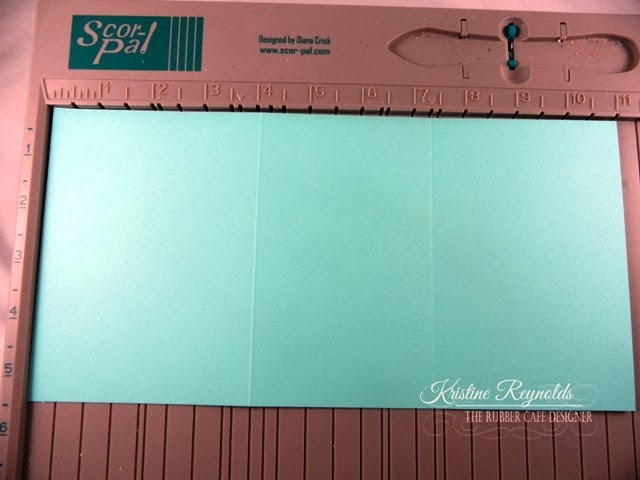 Hope my tip helps you get the most of your paper from this kit!! Flower Layer - 3 x 4"
White Layer - 2 3/4 x 2 3/4"
I used some Kool Tak foam behind the head to get the impression of the pug peeking out from the frame. The papers are from Bo Bunny – Autumn song paper pad. It was part of the October “Fall Harvest” Creative Cafe Kit and it’s absolutely stunning. Such amazing colors! The sentiment is stamped on the Polaroid frame and I added some glitter with the Zig Wink of Stella brush. The eyes and the nose are covered with some Glossy Accent. That’s all from me. Have a great new week!!! 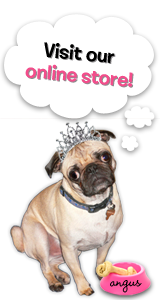 Stamps: The Rubber Cafe – A Pug for the Holidays, Pictures Framed and Dogs are people too!. Ink: Versa Fine – Onyx black. Distress ink - Antique Linen, Scattered Straw, Weathered wood and Black soot. Paper: Water color paper, Pugnacious signature paper white, black and kraft cardstock. Autumn song 6x6 paper pad by Bo Bunny (part of the October “Fall Harvest” Creative Cafe Kit). Other: Button, paper floss, Zig Wink of Stella Brush, Glossy accent.